After voicing Tony Stark’s AI J.A.R.V.I.S. for years, actor Paul Bethany upgraded to The Vision in Avengers: Age of Ultron and subsequently became one of the MCU’s most intriguing characters. The last time we saw the android, he had helped the Avengers defeat Ultron and his robot army, and afterwards he officially became one of Earth’s Mightiest Heroes. Just like most of his current and former teammates, Vision will appear next year in Captain America: Civil War, and his role in the movie will have him taking action familiar to comic book readers. Vision is a captivating character, and he does play a critical role in the Civil War. The comic fans might be able to guess what he is going to do. Thanks to his one-of-a-kind android body and the Mind Stone, the MCU Vision has many of the powers he does in the comics, including super strength, flight, controlling his density, phasing, and shooting energy blasts. That already makes him one of the most powerful participants in Captain America: Civil War, but going off Russo’s comment, it sounds like he’ll have a big moment to shine during the conflict. It’s hard to tell what this thing is he’ll do do, but one possibility is that it will be a recreated moment from Marvel’s original Civil War. In that story’s final battle, Vision phased his arm through Tony Stark’s armor, which disabled the suit and allowed Captain America to strike back at his armored adversary. 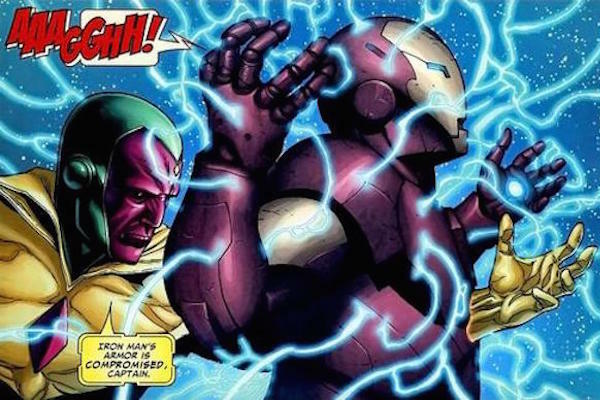 The problem with this happening in live action is that Vision will side with Iron Man in the movie, so unless he switches sides at some point, it wouldn’t make sense for the android to put disrupt Tony’s suit. Besides, as we saw in the first trailer, Iron Man’s going to have a hard enough time battling Captain America and Winter Solider at once, so Vision disabling the armor, either before of after this fight, seems like overkill. Beyond taking part in the fighting, Captain America: Civil War will also see Vision learn more about what it means to be human and what it is to love, which could mean more sparks between him and Scarlet Witch. Beyond that, there’s a rumor he might end up in space after the conflict is over, but whether or not that happens, it’s a good bet he’ll bee seen again in one (or both) of the Avengers: Infinity War movies. After all, he has one of the precious Stones that Thanos is seeking embedded in his forehead. Captain America: Civil War arrives in theaters on May 6, 2016.